39. Albert Theodore5 GOODLOE M.D. 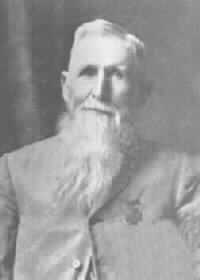 (William Hill6, David Short7, Robert8, George9, Henry10, George11 GUDLOE, Thomas12 GOODLOWE)(67) was born in Maury County, TN, June 23, 1833. He died at 78 years of age February 22, 1912 at "Mount Repose" southwest of Nashville, Davidson County, TN on US 70. He was buried in Mt. Olivet Cemetery in Nashville, Davidson County, TN. He was married to Sarah Louisa COCKRILL in Franklin County, AL at 12:00 o'clock November 29, 1855 by Rev. Justinian Williams. She was born near Tuscumbia, Franklin County, AL December 1, 1837 (in her grandfather John Cockrill III's home according to her daughter Martha). Sallie(68) was the daughter of Granville LaForce COCKRILL and Louisa Maria TURNER. She died at 70 years of age Tuesday morning, March 31, 1908 five minutes past eight oclock, at her home, "Mount Repose," near Nashville. She lies next to her husband in Mt. Olivet Cemetery. Dr. Goodloe was both Physician and Methodist Minister and served in various places in Arkansas and central Tennessee. He studied medicine and received his M.D. in 1853 in Virginia. Before entering practice in New Orleans, however, he was persuaded by his brother to join him in buying farm land in St. Francis County, AR. He combined farming there with a reduced medical practice and the two of them remained there until the Civil War. After a deep religious experience following the loss of his young son, Hill, in 1859, his life was changed and he became more deeply religious. This was expressed during the Civil War in forming bible study and devotional groups among his soldier companions. Shortly after the war, he felt a strong call to enter the ministry. He entered the Methodist Itinerant Ministry and spent the rest of his life as a Circuit Riding Methodist Preacher in central Tennessee. For more specific details of his interesting life, please see this item by item chronology partly drawn from his own autobiographical journals and diaries. I have also included a slave list found among his papers in case it might be helpful to African-American family searchers who visit this site. 40 i. Granville4 GOODLOE M.A. (69) was born in St. Francis County, AR, January 23, 1857. He died Friday, March 24, 1911 at 6:30 p.m., in Arkadelphia, Clark County, AR, at 54 years of age. Granville was Professor of Greek and Vice President at Arkadelphia Methodist College in Arkadelphia, Clark County, AR, from 1892 until his death. The following is taken from Hall's History. (70) "The young Arkansan was educated at Webb School (Bellbuckle, Tennessee) and Emory and Henry College where he was an honor student. In 1879 Vanderbilt University granted its first Master of Arts degree to Goodloe. ... He was also the first president of the Y.M.C.A. at Vanderbilt and the faculty selected him to deliver the class oration at his graduation. A distinguished scholar in chemistry, Greek and history, Goodloe held the chair of Greek at Wofford College for four years (1886-1890) and the same position at McTyeire [!] Institute before coming to Arkadelphia. During his tenure at the struggling, growing Arkadelphia institution he attained a reputation excelled by few associated with the collelge. Some called him peculiar, but his peculiarities were marks of his virtue. Commandant of the local Confederate veterans' association, he displayed the "Stars and Bars" daily before his door and "almost every morning sang 'The Bonnie Blue Flag.'" He kept his pupils alert in the classroom with keen, good-humored satires on student life, and his friendship for worthy students found expression in arduous labors outside the lecture hall. His tutoring sessions before breakfast and after supper for those who sought help in the classics or history became somewhat of a ritual. Today Goodloe's memory is preserved through a men's residence hall, the second to bear his name. He was said to be 'a genuine son of the Old South, for which he showed his love by wearing its uniform in both life and death'." 41 ii. Hill GOODLOE(71) was born in St. Francis County, AR, June 8, 1858. "A most affectionate little boy, he died in Franklin County, AL, at 1 year of age at the residence of Mr. A. H. Southall on Saturday, December 11, 1859 at 11 o'clock a.m.". 42 iii. Louisa GOODLOE(72) was born in Davidson County, TN, September 13, 1859. She died on Friday March 7, 1862 at 10:30 p.m. in Athens, Limestone County, AL at 2 years of age. "Our darling little girl, who endeared herself to all who knew her by her sweet winning ways, died at the residence of Mrs. Judge Coleman. It is painful indeed thus to be separated from the loved little ones, but, though sad, we cannot grieve nor murmur, for it is the will of the Lord." 43 iv. Albert Theodore GOODLOE Jr.(73) was born in Franklin County, AL, July 21, 1862. He died at the home of T.T. Harris, March 31, 1919 in Sumner County, TN at 56 years of age. Rush served as a Methodist Minister in various locations in Tennessee and Oklahoma until he retired. 45 vi. Sara Louise GOODLOE(77) was born in St. Francis County, AR, February 22, 1868. Louise died April 27, 1957, in hospital in Madison, Davidson County, TN, at 89 years of age. She was married to Thomas Tally HARRIS in Sumner County, TN, Wednesday September 1, 1897, at 8:15 o'clock by Rev. A.T. Goodloe - "Papa". He was born March 20, 1860. Tom(78) was the son of Elijah HARRIS and Mahalia Virginia WATKINS. He died April 25, 1921 at 61 years of age. 46 vii. Emily Frances GOODLOE(79) was born in Culleoka, Maury County, TN, August 19, 1870. Fannie died at 24 years of age at the Sumner circuit parsonage Monday evening, December 31, 1894 in Sumner County, TN at about seven o'clock. "She was a faithful Christian, and passed away in much peace - perfect peace with God." 47 viii. Alberta Mary GOODLOE(80) was born in Livingston, Overton County, TN, April 3, 1873. She died in a nursing home September 8, 1955 in Portland, Multnomah County, OR at 82 years of age. + 19 ix. Martha Laura GOODLOE was born October 28, 1875. 48 x. Leslie GOODLOE(81) was born in Montgomery County, TN, December 16, 1878. He died April 8, 1931 in Arkadelphia, Clark County, AR at 52 years of age. He married Frances L. SIMS in Brunswick County, VA, November 28, 1906. Frances(82) was the daughter of Dr. Richard SIMS. She died May 1960. Leslie's occupation: Owner of an Insurance Agency in Arkadelphia, Clark County, AR. 49 xi. Walter GOODLOE(83) was born in Montgomery County, TN, December 16, 1878. "His birth followed Leslie's by but a few moments. His weight: 10 pounds. On Wednesday night July 29, 1896 at half past eleven oclock, he died at the Sumner circuit parsonage in Sumner County, TN. "Like Fannie, he was a faithful Christian, and happy in the Lord as he was passing away to his inheritance on high." 50 xii. Lizzie Mannie GOODLOE(84) was born in Williamson County, TN, May 23, 1881. She died April 3, 1934 in Nashville, Davidson County, TN at 52 years of age. She was married at 9:30 Wednesday morning June 10, 1908 to C. Franklin WAGGONER at Mount Repose in Davidson County, TN by Rev. A.T. Goodloe.